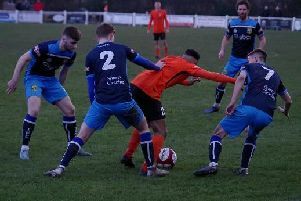 Tadcaster Albion suffered a 4-1 defeat on the road at promotion-chasing Colne in Evo-Stik Division One North. Tom Corner gave the Brewers an early lead before the hosts came from behind to take all three points in the April sunshine. Taddy boss Billy Miller was able to name the same starting line-up for a second consecutive match, a rare feat this season. And the continuity in selection appeared to pay off as the away team started much the brighter and went ahead after just eight minutes. Portuguese striker Carlos Djalo did brilliantly to out-power Lee Pugh and find a way out of the corner to Jordan Armstrong. Armstrong clipped in a cross from the right-hand side to which Rob Youhill left and top-scorer Corner made no mistake striking through goalkeeper Greg Hartley from 11 yards out. The lead lasted a mere five minutes, however, as a corner was flicked on at the near post and bounced into the net off a hapless Taddy head. The pitch at the XLCR stadium holds an incredible slope and despite the home side kicking down the hill in the first half, Taddy were certainly on top in the contest, being first to the majority of balls. Corner was proving to be a menace for opposition defenders as per usual and the towering striker shot on sight at every opportunity but saw effort after effort blocked and deflected. After a number of half-chances for both sides, Colne nudged ahead from the final attack of the first half. Youhill’s attempted switch of play towards Liam Shepherd was cut out and pounced upon by the Reds as Adam Morning was released in behind and the lively forward nudged past Albion goalkeeper Chandler Hallwood. Morning’s touch took him just too wide of the post to apply a finish, but he was still able to tee up Phil Dean for a tap-in. Into the second half and Albion continued to play on the front foot with Youhill almost bursting beyond goalkeeper Hartley just seconds after the re-start. However it was talisman Corner who continued to pose the biggest threat with three powerful strikes at goal, the third of the three almost wickedly deflecting into the bottom corner. Taddy were forced to re-shuffle 13 minutes into the second period when captain Gregg Anderson took a knock to his ankle. The skipper’s departure saw Jason Mycoe come on into midfield and Dan Thirkell drop back into defence alongside Josh Barrett. Albion, now kicking down the slope, looked increasingly more likely to score the next goal as Corner went agonisingly close to his and Tad’s second when his poked effort whistled inches wide of the mark. But as is so often the case, a team’s failure to score when in the ascendency was to prove costly. Colne rode the Taddy storm at the start of the half and then went on to score a crucial third goal to open up a two-goal cushion. A corner curled in from the right-hand side was powerfully headed into the back of the net by defender Mark Ayres. This deflated Miller’s men as the Reds, roared on by their vocal support, grew in confidence. They should have had a fourth a minute later, but substitute Jason Hart couldn’t keep his composure when firing off target after being set away by Spencer Jordan. Dean’s superb bending free-kick was well kept out by Hallwood before a goalmouth scramble resulted in the ball somehow being thumped over the bar from close range. The victory for Steve Cunningham’s side was then secured 12 minutes from time in somewhat controversial fashion. Dean looked to be a good few yards offside at least, but the offside flag was not raised and the Colne man ran through on goal and confidently tucked away his second of the afternoon.